Please Note – Payment only against credit card. Delivery time frame would be 07  10 working days. We thank you for your patience and understanding. 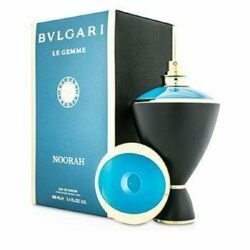 Noorah by Bvlgari is a Chypre Floral fragrance for women. Noorah was launched in 2014. The nose behind this fragrance is Daniela (Roche) Andrier. The fragrance features galbanum, cardamom, iris, benzoin, tobacco, oak, patchouli, vanilla, gingerbread and honey.